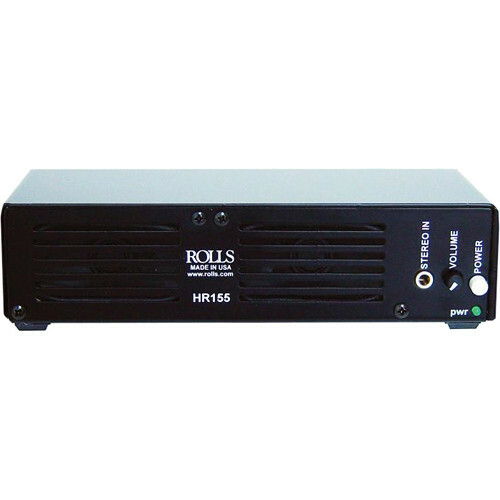 The HR155 from Rolls is a rackmount monitor speaker that provides powerful audio in a compact design. The unit has an all-metal chassis for lasting durability. The rear panel features an XLR line input and stereo RCA line inputs and outputs. The front panel has a stereo 3.5mm line input. This variety of connectors allows you to connect virtually any line-level sound source including mixers, CD players, iPods, and more. The speaker has a 5W output power to deliver a strong performance. The internal amplifier dissipates heat within the chassis, meaning no outside cooling is required. This allows you to mount the HR155 in a rack with units above and below it without worrying about overheating. The unit has a universal power supply for use virtually anywhere. Note: Optional HR31 Rack Ear Kit and RMS270 Rack Mounting System available separately. Box Dimensions (LxWxH) 9.95 x 7.35 x 4.35"
HR155 Rackmount Monitor Speaker is rated 3.0 out of 5 by 1. Rated 3 out of 5 by Anonymous from Average sound and quality This product is fair but I would not purchase this again and would spend a few more $$$ to get better volume and quality sound.